We are delighted to announce completion of works at Herman Millers new national headquarters in Melksham. Situated in the heart of Wiltshire, the contemporary office furniture specialists will use this 170,000 sq ft hub for manufacturing and distribution purposes. This new development has been hailed as the biggest single investment project in the town for a generation and is set to bring a welcome financial boost to the area, with an estimated 200 jobs set to be created. Our works package at this speculative development was well and truly "bespoke"! 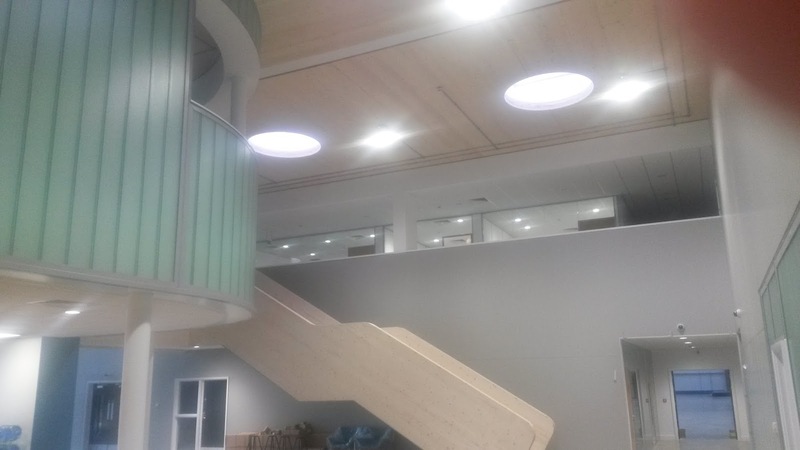 Works here included an internal 'design' street and high spec fit-out incorporating CLT feature timber stairs and balustrades; Topakustic acoustic panelling; curved plasterboard bulkheads; glass division walls; metal ceilings both internally and externally and stainless steel fixture and fittings. Works were carried out to warehouse, offices, showroom, sports pavilion and engineering rooms. The US based company have truly incorporated the ideals of their modern furniture design into their new HQ and in the process, have created a unique office environment, which is reflected by these wonderful completion photos.